SNAFU! : Raging fires in California. Did NorthCom fail again? Raging fires in California. Did NorthCom fail again? U.S. Army Sgt. 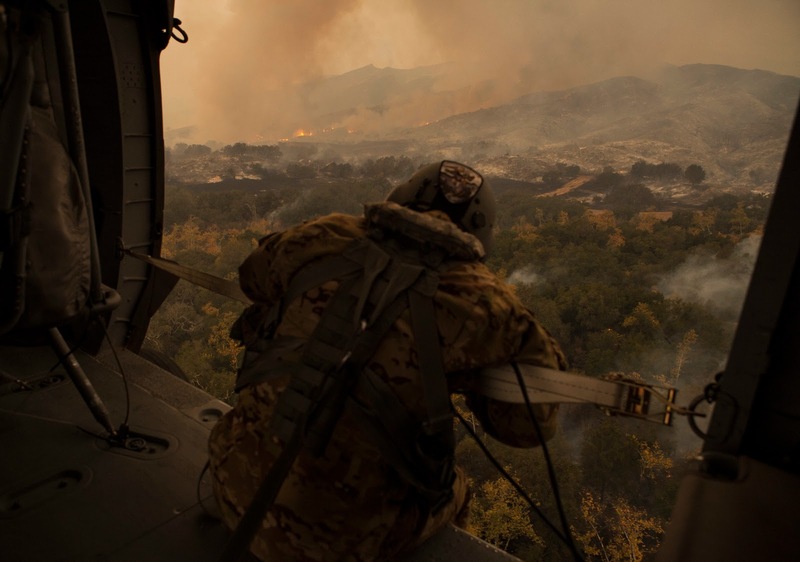 Anthony Orduno, a UH-60 Black Hawk helicopter crew chief with Bravo Company, 1st Battalion, 140th Aviation Regiment, California Army National Guard looks out while flying over the Thomas Fire, Dec. 9, 2017, in Ventura County, California. Orduno and the helicopter crew spent the day dropping water on the fire in coordination with CAL FIRE. By that night, the Thomas Fire had burned 173,000 acres and destroyed more than 500 structures since it started Dec. 4. I've watched the fires in California with a bit of amazement. It looks like Dante's inferno on earth. But what has me puzzled is the response to the disaster. Not from the first responders but once again from NorthCom. I said that the CO of that organization looked like she was in over her head with the hurricanes and I get the same impression with these fires. What good is it to have a lavishly equipped military if they are slow to react to disaster in the homeland? I don't know if it's State Govts trying to "protect their turf", a lack of aggressiveness when it comes to leaning into problems at home...I really don't know, and don't know if I care. They must do better. The Pentagon is all about partnerships? Then setup a 50 seat disaster relief council or some group that will determine independently of the states when an emergency is beyond their control. Whatever the answer is I do know this. After this fire is put out we're gonna hear all kinds of platitudes about how brave and courageous the first responders were. I have no doubt that it will all be true. But I know this too. There will be many people with lost property and homes they can't replace that will be wondering what to do next. I do know that instead of mobilizing the full power of the US military to assist in whatever way it could they instead continued business as usual. That my friends is wrong.